If you are just starting out in business then keeping costs to a minimum is essential. Professional product shots can be very expensive to produce. This quick guide will show you how to set up a low cost but effective photo studio, that will produce great looking shots for your site. You will need a bit of space to set up your mini studio, but you can easily use a spare room or garage in your home. The budget for this home setup will be $285. The idea is to create a setup that is capable of shooting a variety of products. 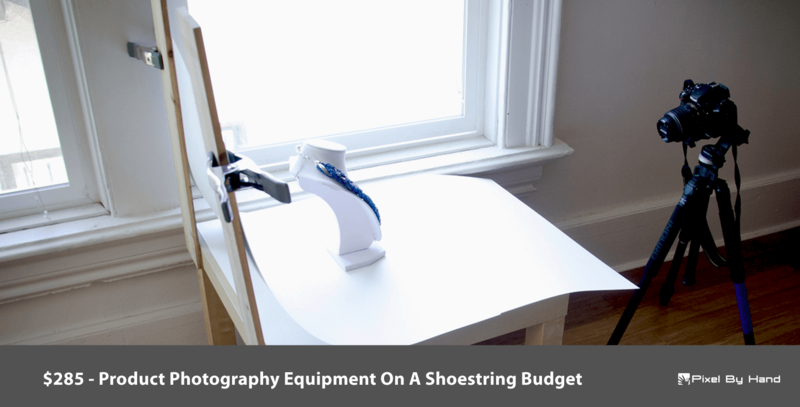 You may think that you need a huge amount of equipment ranging from lighting rigs, too expensive cameras in order to produce effective product photographs. This is not an option for most business start-ups, we want to produce great looking images whilst remaining within our budget and be able to set up our studio in just a few minutes. Obviously, high end and produces a greater number of benefits, but they are simply not needed in order to create effective looking product shots. Almost everybody has a camera at their disposal. With the advances in modern technology, most smartphones have very capable cameras on board. It is important not to worry about the camera you use. Test the equipment that you already have weather that is using a smartphone or a point and Click camera that you already own. If you can afford a more professional camera then it is an option worth considering. If you are going for a more professional option then as a bare minimum it should have manual exposure and aperture settings. Your memory card will be essential for storing your shots. Increases in memory capacity mean you can pick up a fairly substantial card for around $10. Stability of your shorts is essential to avoid any blurring. You want clean and precise shots so a tripod is very important. Tripods come in a variety of shapes and sizes to fit most cameras and even smartphones. You can choose from white paper or white material in order to create your white backdrop. Paper is usually slightly more expensive. It is important that you use one continuous sheet in order to prevent any creases or seams. The background should be continuous. This will avoid you using Photo Retouching Services for background removal. Obviously, the sheet should be big enough to cater for the product you are shooting. Whilst it still needs to fit within your studio setting. White foam boards can be used to reflect light. It is an effective technique to bounce light from a window back onto the product. You need to place the white foam board on the opposite side of the product to the window. We do this so that the product is completely filled with light, from all sides. You will need a table big enough to cater for your products. You may already have one available in your home, but you can easily pick up a low-cost folding as an alternative. The purpose of the tape is to be able to fix your white paper or sheet in place, ensuring that nothing moves when you are taking your shots. In order to take full advantage of natural light, you will need to place your photography setup near a window with a generous amount of light. Based on your product size the window you used should be quite a bit bigger than the product. The lodger the window the more even the light will be. That’s our complete setup for $285. It may be even less depending on the equipment you already have or plan to use. Our next article will go into detail how to actually put all these pieces into a complete studio setup. If you have any questions or need any advice on which equipment to use for your home setup then contact us here.